Some consider birds the flying jewels of the water garden and that is so true, especially if you have plants to help attract them. What kinds of birds will come to your water garden? Well, we couldn’t possibly name them all, but if you’re a fan of the hummingbird, there’s a good chance a pond will help attract them. After all, hummingbirds don’t live on flower nectar alone. They need food, shelter and water too. There are over 150 flowers in North America that attract hummingbirds and hummingbirds can visit about 1000 flowers a day. Throw a few trumpet-shaped flowers around your pond and watch them go! Hummingbirds aren’t the only birds that will come visit your pond, however. Almost every bird is attracted to your pond because of the running water and the chance for food – in the firm of insects! Finches, chickadees, nuthatches, bluebirds, and several other varieties of birds will be proud to call your pond a home away from home! 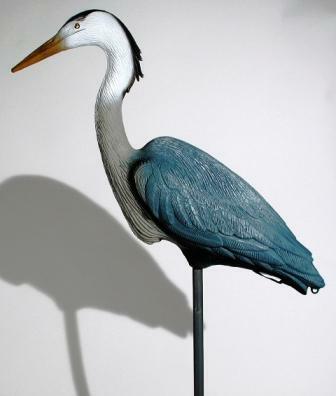 There’s on particular bird that you may not be so happy to see … the great blue heron. It makes every koi duck for cover and every pond owner run out to get a motion detector. Any time you have a feature that attracts wildlife you like, you’re also going to get some of the less popular animals. In this case, the great blue heron is the villain, searching out plump koi to pluck from your pond. Don’t worry though … your koi are resourceful little critters and will find a place to hide if you provide fish caves and overhanging rock and plant cover! But don’t let the great blue heron ruin your wildlife pond party. Enjoy the others and give that heron a great big squirt of water when you see him so he knows he’s not welcome! Install fish decoys, heron decoys, or the new scarecrow.